Asbury University President Sandra C. Gray’s commitment to both the University and the Jessamine County community is evident to many. So evident, in fact, that Gray recently accepted two awards from Kentucky organizations for the deep impact she’s had on not just the Asbury community, but also the greater Central Kentucky community. Last month, Gray was honored at the Jessamine County Chamber of Commerce Annual Award Dinner. The masquerade-themed ceremony was held on Jan. 17 at the RJ Corman Railroad Group in Nicholasville. Here, Gray was given the award for Outstanding Business Leader of the Year. Award winners are selected based on several characteristics including an established leadership ability and success within the county’s business sector, an evident support of the county and its positive growth as well as having demonstrated high standards of business, customer service and Jessamine County community pride. At the dinner, Gray and other business leaders who strive to make Jessamine County a great place to live, work and play were honored. Executive Director of the Jessamine County Chamber of Commerce Ronda May was quick to praise Gray for her impact on the community as a whole and notes that she will be deeply missed by many in Jessamine County. “Dr. 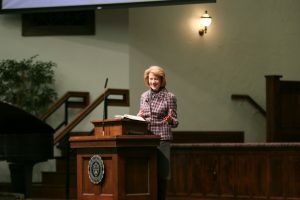 Gray has exhibited such wonderful direction and drive for the University, which overall impacts the county as a whole, [through] her leadership in taking Asbury to the next level, especially when it went from being a college to a university, and now in the growth and the expansion that’s happening on campus,” May said. On Feb. 5, Gray was honored at Bluegrass Tomorrow’s Annual Vision Awards Breakfast, where she received the Vision Award for Excellence in Education. The breakfast was held at the Marriott Resort Griffin Gate in Lexington where guests enjoyed a special farm-to-table meal, networking and local food exhibits. President of Bluegrass Tomorrow Rob Rumpke and his committee were impressed by the ways in which the University grew during Gray’s time as president. Gray was chosen for the award due to her demonstrated engagement in higher education within the state of Kentucky and a faithful commitment to its improvement. Please join us in congratulating Gray on her most recent community awards and her great dedication to improving our state.